Poetry and photography blend together beautifully in this author's work. On their own, each is exquisite. Combined, they become something else—a powerful composition that blends the best of both: that is what happens in this book. The explanations give poetry lovers and budding poets a deeper appreciation of the genre. This will appeal to lovers of photography, poetry, and students alike. A photograph is worth a thousand words. Poetry paints word pictures using poetic imagery. The author is inspired by the image, and from it, poetry flows to dance and enhance the whole upon the page. Images from the eye of a photographer that translate to the mind of the poet. Thirty-five poetic formats, full-page eye-catching photography, and poetic techniques are all here for poetry lovers, photo enthusiasts, students, and teachers. Just like volume 1 and 2 of this book, volume 3 warms your soul and melts your heart with its beautiful photographs and poems. The chapters have been organized by the category of photograph for the picture lovers, then in alphabetical order of the poem’s title. There are chapters with Animal/Wildlife, Birds, Flowers, Gardens, Paths, Scenes, as well as Sunrise and Sunsets. 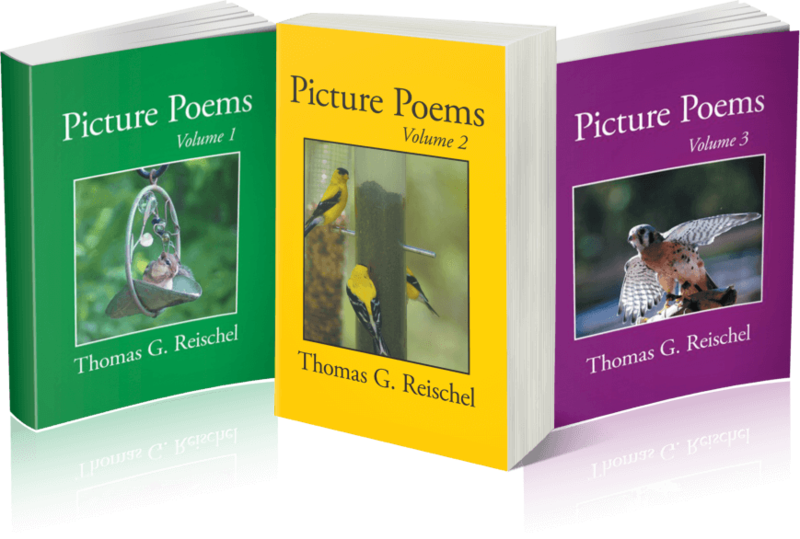 Thomas Reischel stuns his readers with beautiful photography and poetry. They say that a picture paints a thousand words, but a photograph mixed with a beautifully written poem is worth more than a thousand words. This is exactly what author Thomas Reischel gives his readers in his three-volume book, Picture Poems. From volumes I to III of Picture Poems, the author combines poetry and photography beautifully. Readers are able to see the pictures from the eye of a photographer and understand their meaning from the poet’s perspective. “I believe that photography and poetry go together well. One paints a visual picture, while the other creates a poetic image. Together, the synergy becomes very powerful,” states the author. Absolutely enthralling, Picture Poems will warm the soul and melt the heart of every poetry lovers and photo enthusiasts.